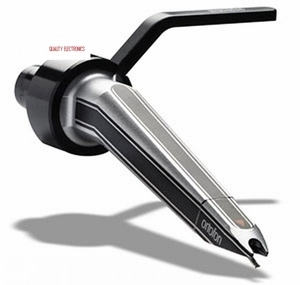 Ortofon and Serato are proud to announce the release of a revolutionary new high performance cartridge for DJs. Ortofon introduce the new �Ortofon | Serato S-120 DJ Cartridge� with a patent pending design that will virtually �hug the grooves� of a record using a unique suspension system that the two companies have co-designed. All vinyl DJs will benefit from the extreme tracking ability delivered by a revolutionary new cantilever suspension. With 4.0 gms of vertical tracking force, the Ortofon | Serato S-120 achieves an amazing tracking ability of 120 μm compared to the conventional 80 μm at 315Hz. That is a 50% improvement on standard DJ cartridge performance. The product is available in Concorde and OM versions. * Ortofon | Serato S-120 Concorde, a heavy 20gm standard Concorde mount cartridge and Ortofon | Serato S-120 OM host the new S-120 Stylus. * Ortofon | Serato S-120 Concorde is supplied with an extra weight to take advantage of the superior tracking ability of the Ortofon | Serato S-120 Stylus. * Ortofon | Serato S-120 OM is provided with matching custom head-shell with graphics that allow for easy mounting.